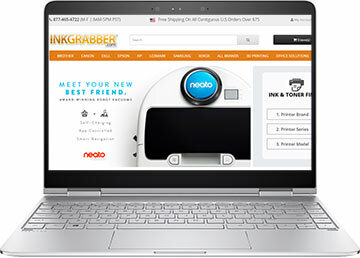 Inkgrabber coupon codes, such as those listed on this page, can provide discount savings, free shipping, or other deals on printer ink cartridges. Whenever you need printer ink, make sure you stop by GeekAlerts.com to look for the latest Inkgrabber.com coupons and promotion codes. You can be assured that if there is a current Inkgrabber free shipping promo or discount offer, we’ll try to have it listed right here. We techies are always interested in computer parts, but sometimes, like everyone else, we just need basic everyday printing supplies such as printer ink, inkjet cartridges, and toner. Inkgrabber.com (now simplified to just Inkgrab.com) offers affordable printing supplies with a one year product guarantee, a 100% satisfaction guarantee, and a 100% price match guarantee. If you find a better price on ink cartridge within 30 days of purchase, they’ll refund the difference. If you receive a damaged or incorrectly shipped item, they will replace it at no cost the same day for up to one year from the original purchase date. They stock a wide variety of printer inks and can find toner or inkjet cartridges not currently listed on their website if you contact them. Shop for printer inkjet cartridges, laser toner cartridges, refills, and color ink cartridges. Get ink for trusted printer brands ranging from Apollo, Apple, Brother, and Cannon to Sharp, Tektronix, Toshiba, and Xerox. Purchase HP laser toner cartridges, Pitney Bowes postage meter and ink cartridges and printer supplies, or Epson ink and toner cartridges. Find ink for Compaq, Dell, Hasler, IBM, Kodak, and Lexmark printers. At inkgrabber.com, you also find ink cartridges that are compatible with Konica-Minolta, Mita-Kyocera, NCR, NEC, and Okidata printers. Ink supplies are available for other well-known printer brands, including Primera, Ricoh, Samsung, and Panasonic. The ink grabber website allows you to track orders, contact customer service, troubleshoot problems, and locate coupons for even bigger savings on already discounted printer ink, toner, and ink supplies. There’s no reason to make a special trip to an office supply store when you can quickly click over to www.inkgrab.com and order all of your printer ink online.